Ben Simmons missed most of Saturday’s game with lower-back tightness. The 76ers' Ben Simmons did not practice Monday and is officially listed as questionable for Tuesday's game in Detroit. Simmons missed practice with lower back tightness, the same reason he left in the first quarter of Saturday's 116-115 win over Orlando. 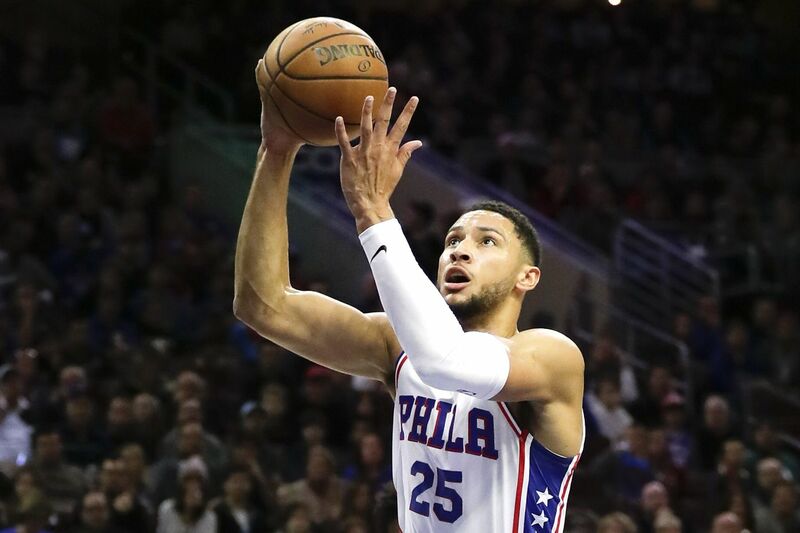 Sixers coach Brett Brown said he would most likely err on the side of caution if it came down to a close decision with Simmons, but he would not rule out the possibility that the reigning rookie of the year would play against the Pistons. "Nobody said he's definitely not playing," Brown said. "He's progressing. He did not go through practice today … but he's progressing." Fultz, of course, is the hot topic, and there's no denying that all eyes will be on how he performs if Simmons doesn't play. The most obvious and immediate difference for Fultz in a Simmons-less lineup would be that Fultz would start the game as the primary ballhandler instead of sharing duties with Simmons. Given the chance to start the game at point guard, Fultz conceded that he thinks it would get him into a better rhythm. "To have the ball in my hands a little bit more, I just think it gives me the chance to run the team and be the playmaker that I am to start off," he said. This past summer marked the first time Joel Embiid had a healthy offseason as a Sixer. Last season, he started the year on a minutes restriction and was not cleared to play in back-to-back games until February. With the team's first set of back-to-back games coming up, it's important to note there is nothing holding the big man back. "There have been no restrictions given to me in any shape or form," Brown said regarding Embiid. After the game against the Pistons, the Sixers will travel to Milwaukee to take on the Bucks on Wednesday. While Zhaire Smith (broken left foot), and Jerryd Bayless (left knee sprain) remain out for the foreseeable future, offseason acquisitions Mike Muscala (left ankle sprain) and Wilson Chandler (left hamstring strain) are getting closer to a return. Muscala, whose injury is a lingering one from last season, was a full participant at practice Monday and was listed as questionable for Tuesday's game. Brown said that because the injury was one that Muscala wasn't able to get in front of last year, he would rather have him heal completely and take some extra rest time so that when he does come back, there would be no hesitation or concern about re-injury. Chandler, who was hurt in the preseason opener against Melbourne United, was a partial participant Monday in practice and continues to make progress in his rehab. He previously pegged Saturday's home game against Charlotte as a hopeful return date, and he will be reevaluated before that game.